Internet-based business or e-commerce relies on its Internet resources being always available. Every case of downtime means lost visitors and hence lost customers. To reduce resources downtime, they should be constantly monitored. To operate smoothly, all the e-commerce services must be available 24/7 and must function as expected. What’s also important is these services interaction: it should not be broken, otherwise the whole business comes to a halt. Internet shop, payment processor/billing, customers Helpdesk and so on – all these services must be not only visible to the business’ owner, they should also interact with one another without interruptions. E-commerce services are often hosted at different providers. The more services e-commerce business uses, the harder to detect the points of failures, the more cryptic are possible errors. What’s worse, unscheduled downtime means losses: if services interaction isn’t closely watched, business will inevitably face long downtimes and all the consequences. Inability to maintain all the services up and running does not leave business chances to survive. It’s easy to watch a single network server, device or website, even manually. However, most modern pieces of software and services are too complex to monitor those manually. It is not enough to test for the service presence. It’s necessary to run specific tests periodically – the tests that would confirm the service works as expected. It can be either a loading of service status page (provided the service maintains such a page) or simulate real-life interaction, from a human visitor or from another service. In such a case manual monitoring can’t be efficiently performed. One should use an automated solution, either self-hosted, or provided as SaaS (software as a service). 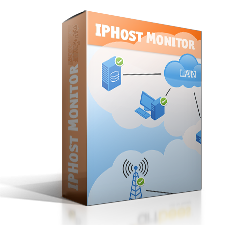 IPHost Network Monitor is the piece of software that can lift the burden of watching network resources state and availability off shoulders of e-commerce business owners. Let’s explain how it can be done. How can IPHost Network Monitor assist you in keeping your e-commerce business up and running? The piece of software allows to monitor all types of Internet business for any scale: from a small single-site facility to complex distributed solutions, utilizing a number of interacting complex services. 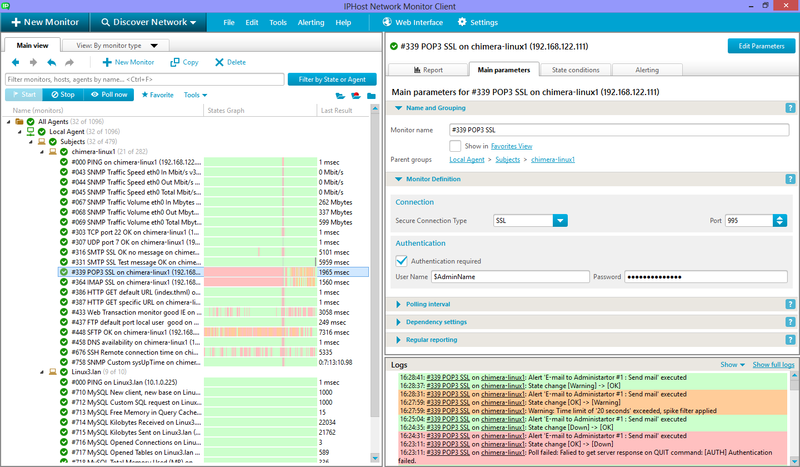 All the monitoring data are available from a single command center; it makes its analysis much simpler; it’s also easier to detect the point of failures using monitors dependency. It is possible to perform complex scenarios of monitoring. Say, we can emulate user visiting a website, logging in, proceeding to a specific page and clicking on specific links. We can also demand that the resulting Web page contain (or does not contain) specific content, thus making extremely simple means of checking every possible functionality. When there are structural or functionality changes, updates, scaling, movement and so on – in allin every such a case it’s easy to tune existing monitors to reflect the new services interaction model. You cannot afford leaving you e-commerce business without monitoring, and IPHost Network Monitor provides all the required functionality right out of the box. If we assume an ‘average’ e-shop is to be monitored, let’s choose monitor types we would require. Web Transaction Monitor, allowing to emulate user’s activity (opening site in a browser, filling forms, navigating across links), to make sure all the user interface sections work as expected. SNMP custom and/or SNMP traps. SNMP is a universal and efficient means to make sure that given parameters of a network device (say, server load, RAM amount, disk space available etc) can be watched and wherever necessary, proper alert be sent to the system administrator. Make sure all the crucial services are available and function normally. HTTP monitor, a ‘small brother’ of Web Transaction Monitor, allowing to load an URL and find a given string on it, along with checking for proper server response. This is in most cases powerful enough monitor that doesn’t involve making the service to fulfill a resourceful operation. ODBC monitor, allowing to run queries against the linked database backend to make sure DB structure is valid and all the vital data are available. ICMP (Ping) monitor. A simple query for server presence might be used as a dependency monitor: if there’s no valid response, no need to run heavier monitors at all. 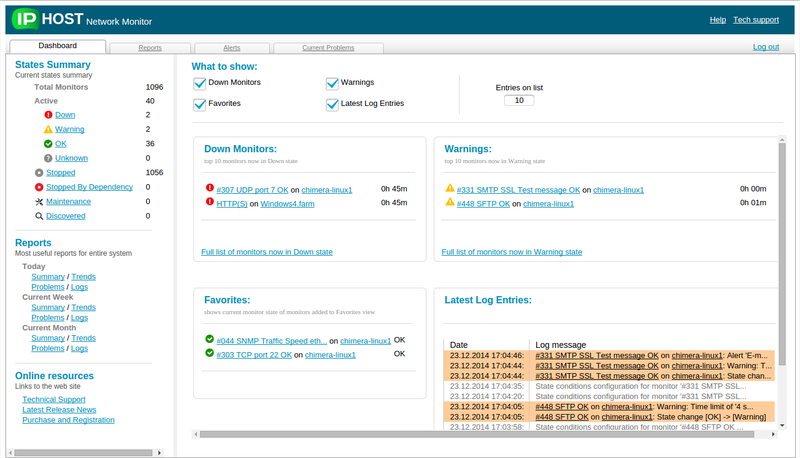 The list above reflects a typical list of network monitors that can be used to efficiently watch an average e-commerce installation.